Decorating your apartment can be a lot of fun, but it can also get expensive. Fortunately, many of the decor items commonly found at high-end retailers can be handmade at home for a fraction of the cost. The team here at TLC Properties has compiled the top DIY decor ideas for sprucing up your space on a budget. And, the best part? These ideas are so simple, they’re virtually #PinterestFail-proof. Whether you just moved into a new space, or simply need a change of interior scenery, read on to learn the best DIY hacks for the ultimate apartment makeover. Give your dresser a modern upgrade. 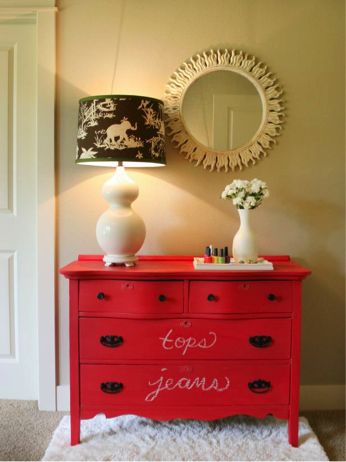 Modernize your childhood dresser (or an antique thrift find) with a coat of chalkboard paint! Once the paint is dry, use colorful chalkboard pens to label each drawer, or create an artistic expression all your own. For a contemporary finishing touch, remove the drawer pulls and coat with metallic spray paint in the color of your choosing. 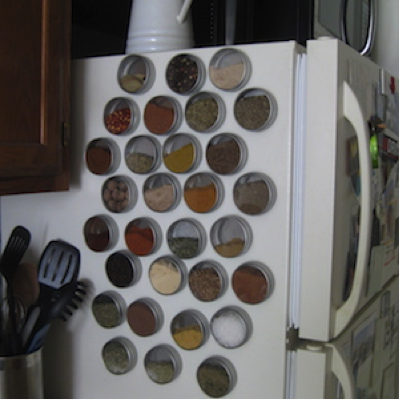 We love decor that is both pretty and functional, and these spice rack magnets are just that! Simply purchase several round clear-top tins from the dollar store, then fill each tin with a different spice. Add a stick-on magnet to the back of each tin and ta-da! All of your spices are now easily within reach and double as neutral-palette fridge art. Chicly organize your bathroom necessities. 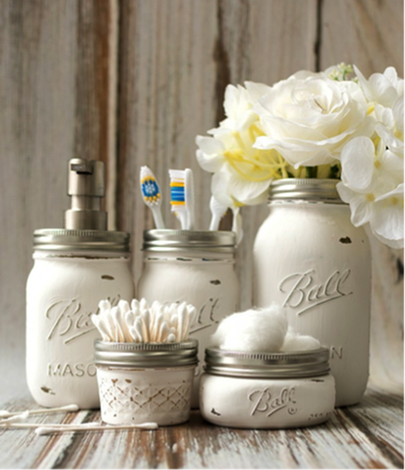 These chic, vintage mason jars can quickly transform your commode’s countertop. If you don’t already have a few spare mason jars lying around, you can purchase a case at most major department stores for around $12. You’ll want to begin by coating each mason jar with ultra-matte chalkboard spray paint. White is always a classic choice, but feel free to get creative by using a bright blue, happy yellow, or moody black instead — whatever suits your current bathroom personality! Next, use a piece of sandpaper to gently scrape away some of the paint to create that lovely antiqued look. Finally, add a soap pump or flower frog lid to transform the jar into a functional storage piece. Toss in some couch art. 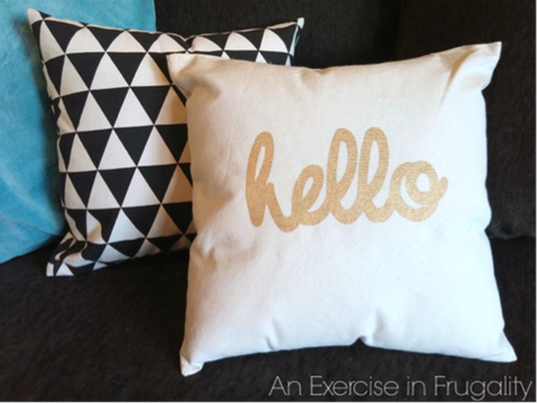 These ultra-cute toss pillows will give your living room an instant facelift for only $7 — and that’s not even the best part...there's no sewing skill required for this DIY! First, you’ll need a canvas tote. If you don’t have one on hand, head to your local craft store where canvas totes can be found in a variety of patterns for under $5. Then, carefully cut off the tote handles and pack the tote with poly-fill stuffing. Next, fold over the top edge around the tote (you may want to use a hot iron to get the seam to lay flat). To seal your pillow, use a hot glue gun to seam each side together. Reflect on the beauty of mirrored vases. The beautiful mirrored appearance of “mercury glass” can add a touch of glitzy glam to any space in your apartment. These mercury glass vases can be used to display flowers, or, try adding a battery-operated tea light candle inside for a warm, soft glow. Fill a spray bottle with 1/2 water & 1/3 vinegar, then set aside. Clean the inside and outside of your vase using glass cleaner or a cloth. Tape newspaper around the outside of the vase. 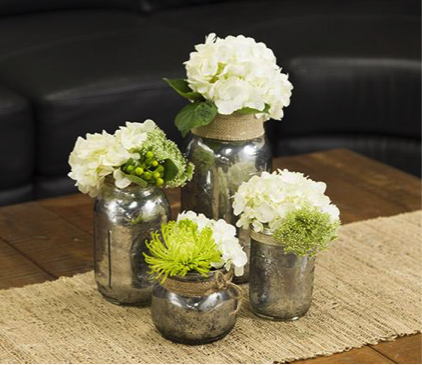 Use Rustoleum Mirror-Effect spray paint to thoroughly cover the inside of the vase’s surface. While the paint is still wet, spritz the paint with your water and vinegar solution. Blot the inside of the vase with a paper towel for a distressed effect. Repeat steps 3 and 4 until you achieve your desired look. Frame up your coffee table knick-knacks. 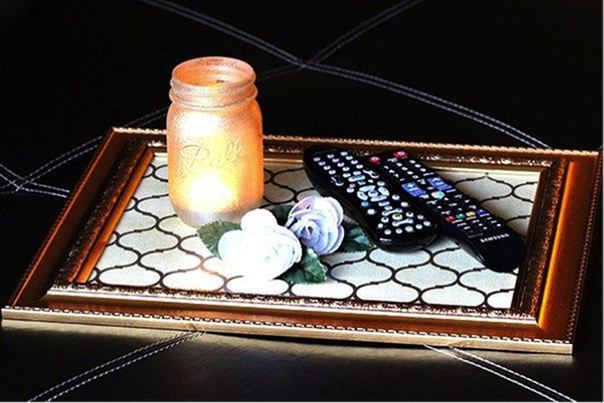 A decorative tray provides the perfect place setting for remote controls, keys, coasters, or anything else that may be randomly strewn across your coffee table. You can make your own for less than $10 using a frame and a placemat. Simply trim and fit the placemat to your frame, then lay flat on a coffee table, ottoman, or chaise lounge. Scrap together some unique wall art. The wall art at your local decor store can sometimes feel so...cookie-cutter. For artwork that is guaranteed unique to your apartment only, try scrapbook paper! Scrapbook paper is a cheap way to get professional quality patterns in virtually any color imaginable. Each sheet of paper costs anywhere from 50 cents to $2. All you’ll need are (9) 12”x12” wood or flat canvas squares, (9) 12”x12” pieces of scrapbook paper (try to look for contrasting colors and patterns), and Mod Podge glue. Brush a layer of Mod Podge on one panel. Apply a piece of scrapbook paper to the panel. To smooth the paper onto the panel, use a ruler or credit card. Start smoothing the paper from the middle and push out toward the edges to eliminate air bubbles. Glue paper to the remaining eight panels in this same fashion. At your option, you can seal the paper onto the squares by brushing on an additional layer of Mod Podge over the top. 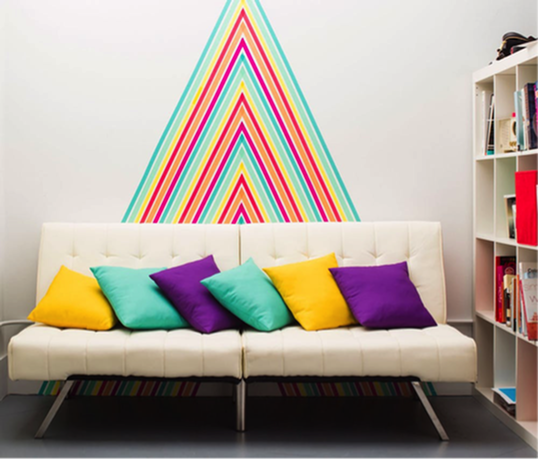 Washi Tape is a fickle decorator’s dream; add bold colors and patterns to your walls in a snap, then remove it without any damage when you want to try something new. 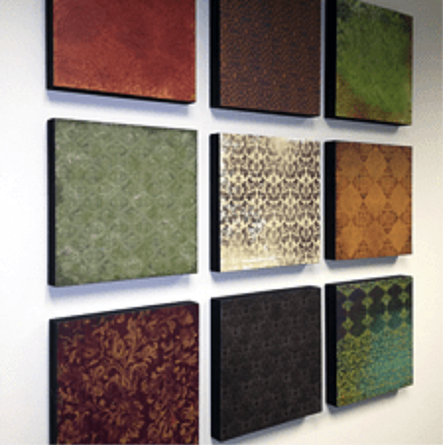 Experiment with shapes, patterns, diagonals, or even polka dots. 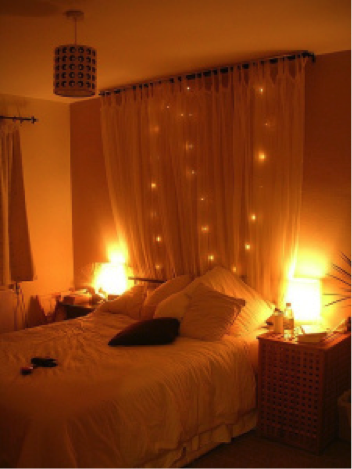 Spotlight your sleep spot with twinkle curtains. Headboards are so 2017! Create a colorful curtain backdrop instead — and for a fraction of the price. All you’ll need to create this dreamy look is a sheer curtain, curtain rod, string lights, hammer, measuring tape, and pencil. First, adjust the curtain rod to just beyond the width of your bed. With the tape measure, measure one inch from the ceiling and 55 inches across, then mark each spot with a pencil. Hammer the rod anchors in the wall on the marked spots. After securing the anchors, hang the string lights with the help of a couple thumbtacks or better yet, damage-free Command strips! Next, arrange the curtain on the rod. For a more bunched, fuller look, use two curtains. Finally, fix the rod to the anchors. Let your creative juices flow for an apartment makeover that won’t break the bank! Is your apartment currently adorned with any DIY decor? 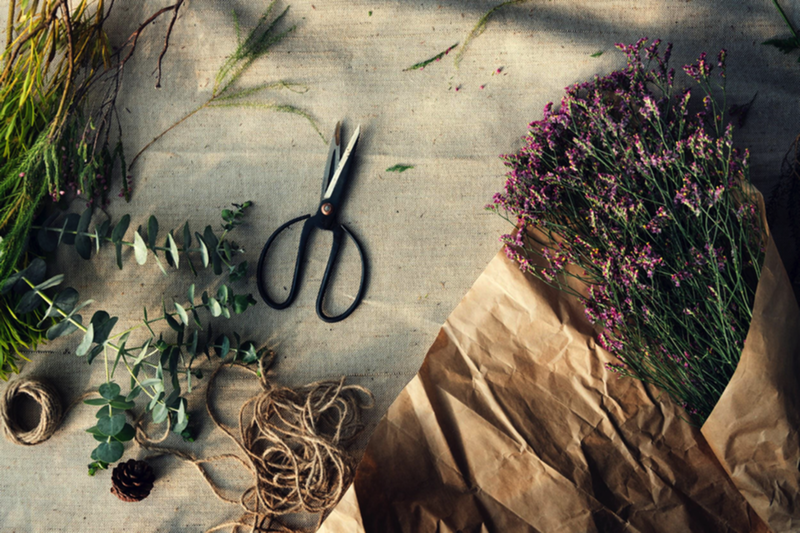 Share your crafty creations with us and others in the comments section below.